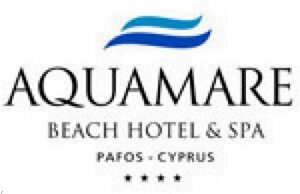 Opened in August 2006, the Aquamare Beach Hotel & Spa is a luxury 4 star hotel located in a very convenient location, on the beach front in the Kato Paphos area. It is located 3 km from the Paphos fishing harbor, 3 km from the city centre and 15 km from Paphos International Airport and 160 km from the Larnaca International Airport. The hotel comprises of 116 inland and sea view rooms, 8 family suites, 8 Superior rooms and 2 executive suites will extensive room amenities, 2 large conference rooms, 4 swimming pools (including 1 childrens novelty pool), tennis court, indoor/ outdoor childrens club, 3 restaurants, 2 bars, fitness centre and a luxurious spa comprising of 24 treatment rooms. Family Room - Spacious with sea view.Family rooms caters comfortably a family of four with a king size bed and fold out sofa bed for the children. Amenities in the room include, mini bar, safe deposit box (free of charge), tea & coffee facilities (free of charge), balcony with table and chairs, satellite TV, International direct call telephone, spacious bathroom with telephone extension all within a fresh decor. Royal Executive Suite caters comfortably up to four persons, with a king size bed and fold out sofa bed for another two persons. Amenities in the room include, 2 bathrooms, mini bar, safe deposit box (free of charge), tea & coffee facilities (free of charge), very large balcony with outdoor furniture and sun beds with full coastal sea views, satellite TV, International direct call telephone, spacious bathroom with telephone extension. Decor is classic and luxurious. Standard Inland Room - Amenities in the room include mini bar, safe deposit box (free of charge), tea & coffee facilities (free of charge), balcony with chairs, satellite TV, International direct call telephone, bathroom with telephone extension. Standard Sea View Room - Amenities in the room include mini bar, safe deposit box (free of charge), tea & coffee facilities (free of charge), balcony with chairs, satellite TV, International direct call telephone, bathroom with telephone extension. From Larnaca Airport: After leaving Larnaca airport follow the motorway sign to Pafos. There is a motorway all the way to Pafos. When you enter Pafos you will find a large roundabout. Keep to the left lane, take the first exit & follow the dual carriage wayuntil the next roundabout. (Debenhams Department Store on the left). Take second exit, continue along the road, straight across the traffic lights then straight across the small roundabout, at the bottom of this road keep to the right hand side and follow the road. This is the coast road to the harbour, continue along this road with the sea on your left.